Obi Wan had a knack for mediating and negotiations in during the Clone Wars and became known as the "negotiator". You can uphold Obi Wan's sense of dexterity with this Adult Deluxe Obi Wan Kenobi Clone Wars Costume. The Star Wars costume includes an ivory, black and white tunic that is made of 100% polyester and features foam armor plates. A brown foam belt ties behind the back while the matching pair of pants have an elastic waist. 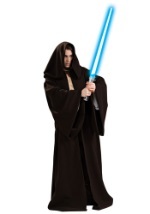 Team up with Qui-Gon Jinn and defeat the federation this Halloween!